Well, it’s been talked about, blogged about, chatted about and part of the video footage and pictures have been published on a number of websites, blogs and Facebook pages, but I’m now going to set the record (pardon the pun) straight. At 9:30pm on Saturday night, 27th June 2009, Singapore’s number one illusion team not only mesmerized thousands of people at the Central Promenade, Clark Quay when they broke the world record of the highest number of illusions performed in 5-minutes (well-known and promoted as the “Impossible Record”), but after this ground-breaking feat, the pair of inspiring and charisma-charged performers conducted some jaw-dropping tricks in an “up close and personal” get together with Aussie Pete and some of the other bloggers that have been short-listed to the OMY 2009 Singapore Blog Awards. After some initial introductions and brief chat, an amazing card trick began. It all started with the bloggers being asked by the OMY admin team to bring along a deck of playing cards on the night. J C Sum asked to be handed one of these decks. The pack of cards handed over was extremely unique, in that they were from Thai Airways (some jokes about loyalty to Singapore’s own airline were made). J C gave me the cards and asked me to share half with another one of the bloggers. We then proceeded to shuffle and mix up the cards into complete random order. We recombined the deck and handed them back to J C.
Then J C displayed the picture side of the cards to everybody by spreading them out and verifying that it was in fact a regular deck, with no duplicates or ‘tricks’ (there was also ‘nothing up his sleeve’) – this was indeed just an ordinary, unique pack of randomly mixed Thai Airways branded playing cards. Next phase of the trick, J C asked another of the bloggers if he was right-handed or left-handed, with the response being to the former. Using his right hand, the same blogger was asked to randomly point at another of the blog finalists. His choice? – Me, Aussie Pete. The cards were turned face-down so that just the branding was showing. J C fanned through the deck slowly asking me to select any card. Being somewhat of a ‘skeptic’, and thinking I would make this more difficult for the magician, I purposely selected a card that was not readily visible and completely randomly sitting within the rest of the deck. J C then asked me to take a step backwards so that no one could possibly see the card when he displayed it to me (I made a concerted effort to look over my shoulder and around me to ensure that no one could secretly view the card from within the wings of the stage). Feeling confident, I took stock of the card that I had selected – the seven of hearts. At this stage, not one other person in the entire group knew what number and suit I had selected!!!.... or did they???? Hmmmmm….. The full pack of cards was placed back into one hand of the original blogger who had provided the deck (face down in a pile). 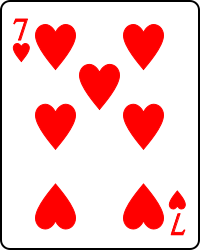 He then slid the selected card (seven of hearts) into the middle of the deck, with around 1/3 of the back side of the card exposed. This is where things took a turn for the mysterious and amazing. A small table with a laptop was slid in front of me. We were told that J C Sum and ‘Magic Babe’ Ning had visited each of the blogging VIPs’ websites during the day and prior to the grand event at Clark Quay. They went on to say that they had left a comment on just one blog. We wish you all the best and good luck in winning the SG Blog Awards. By the way, my favorite number is 7 and 'Magic Babe' Ning loves Hearts. My first reaction was to look at the timestamp to determine if the comment had somehow been posted in the brief seconds after I had viewed the selected card… in usual blogspot style, the comment appeared that it had been left at 7:19am – I was later to calculate the time differences and can confidently state now that it was actually posted at 10:19pm on Saturday night – at least one full hour before we even met the illusionist superstars!!! If this entire episode was not dizzying and mind-boggling enough already, J C then asked the blogger holding the deck of cards to slowly push the partially exposed card that I had previously selected back into the pack until flush. He then asked me to flip over the top card in the deck…. Amazement number 2 (or is it now 3 or 4? ), the top card was in fact my selection again (drum roll) – the seven of hearts!!!! Needless to say, I spent many hours lying in bed that evening trying to recreate the events in my mind and finding loopholes that would indicate the trickery involved – this is just how my mind works… I must find logic in the illogical… the only thing I can come up with is that somehow there was a ‘mix’ of conspiracies and complicities aimed directly at me by a number of people – which I now find almost implausible. My logical thought process tells me that along with some amazing ‘sleight of hand’ (which no doubt J C is capable of), blogger number 1 (deck of card owner) must have conspired to provide the seven of hearts to the magical duo before the event, and ALSO blogger number 2 (the random pointer) must have been secretly instructed to point at me when asked. My summary – J C Sum and ‘Magic Babe’ Ning are just top notch performers and masters of their art… I was watching the entire process extremely closely and saw nothing amiss… great job guys!!!! – You really did OWN me on Saturday Night!!!! 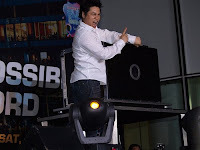 On 27 Jun 2009 at 9.40pm, J C Sum & 'Magic Babe' Ning set an official world record for “most number of grand illusions performed in 5 minutes” by presenting 15 illusions within the stipulated time period. More than 3000 people turned up to witness history being made at the Central promenade by the iconic Singapore River. The outdoor event was entitled “The Impossible Record” and was the closing highlight of the Singapore River Festival 2009, organized by the Singapore Tourism Board. The International Brotherhood of Magicians and the Singapore Book of Records officially adjudicated and endorsed the world record attempt. The record is the first ever magic record of any kind to be adjudicated by the Singapore Book of Records and is also in the process of being submitted to Guinness World Records. Here is the official list of 15 illusions that was endorsed by the representatives of the International Brotherhood of Magicians and Singapore Book of Records who adjudicated the record attempt. It was agreed that in the context of this record attempt, an illusion is considered successfully executed as long as the magic effect is completed, even if the choreography of the illusion is not completed. i think as long as your conscience is clear, you do not have to get bothered by other's talks and accusations. some people are just plain jealous that you can get into the top 10. while they probably did not. such cowards only dare to talk about people behind a screen anonymously. they are the real losers. That was some major pwnage. JC and Magic Babe must have been some real good magicians. I watched the thing and I also cannot think of a way how it was done. :) I love magic. In fact they simply "made you" choose the hearts of 7 (where there are numerous easy ways of doing so, especially with card decks), and therefore were able to post that comment already earlier etc etc. Gidday AAM - long time no hear - I hope you're doing well!! I'm with you on the trick... but still don't know how they managed to palm the seven of hearts in such a short amount of time from a deck given them by another blogger (unless she was in on the trick) - also, how to make the third blogger select me at random? The comment was on my blog alone... see why the paranoia kicks in? Were they all in on the trick besides me?... after speaking with the other bloggers involved, I really don't think so (perhaps I'm too trusting of people :p)... I'm not normally the 'conpiracy theorist' type... take care, my friend! !